The Peruvian government is cutting the price of flights and hotel rooms to help the struggling tourism industry. Recent floods cut off access to Machu Picchu, Peru's top tourist attraction. The inaccessibility of Machu Picchu is costing the Peruvian tourism industry at least a million dollars a day. Some 68,000 people a month normally visit the Inca fortress. Last month around 4,000 tourists were stranded for up to five days in a town beneath the ruins, after flash floods and mud slides damaged the railway. Since then thousands of foreign tourists have cancelled their holidays to Peru. Apart from making a four-day trek along the Inca trail, a privately-owned railway line was the only the route to or from the site. Now domestic tourists are being offered half-price flights and hotel rooms to visit Cusco, the city nearest the world-famous Inca site. 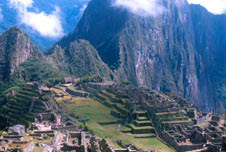 They won't be able to visit Machu Picchu but will have access to a host of other archaeological sites of Inca origin. The Peruvian government is considering making a similar offer to international visitors as the Cusco region accounts for some 90% of its tourism revenue. Peru's tourism minister, Martin Perez, predicted Machu Picchu, which survived the rains unscathed, will be reopened at the beginning of April.